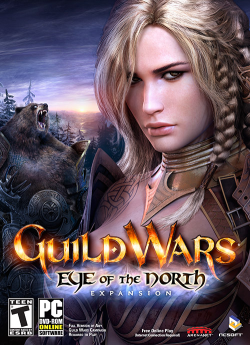 Guild Wars: Eye of the North® is the first expansion for Guild Wars® with content geared exclusively for characters level 10 and higher. Return to the battle-scarred continent of Tyria, the home of the original Guild Wars® campaign. There, old friends await, ready to assist you in settling past scores. But an even greater threat looms.... The land has erupted, spewing forth a race of beings with only one thought—destroy everything. Win or lose, your actions will set the stage for Guild Wars 2®. Enter the Depths—Explore a sprawling underground complex of caverns that spans an entire continent, promising 18 multi-level dungeons rife with traps, puzzles, and secret passages. Should you make it past these obstacles, you'll face foes more cunning and powerful than anything you've seen before. You Can Take It with You—Your achievements, trophies, and titles from Prophecies, Factions, Nightfall, and Eye of the North will not be forgotten. Your Hall of Monuments will preserve them until your descendants can claim them in Guild Wars 2®. 150 New Skills—Play with skills unlike anything previously seen in Guild Wars®, such as the Light of Deldrimor, which can simultaneously detect hidden objects and smite evil foes. 40 New Armor Sets—A combination of powerful new sets and rare stand-alone pieces worthy of the great heroes of the land. Bonus Item—Fire Imp combat ally to assist in your adventures. After you log into the game, type "/bonus" in the chat window to have this added to your inventory.